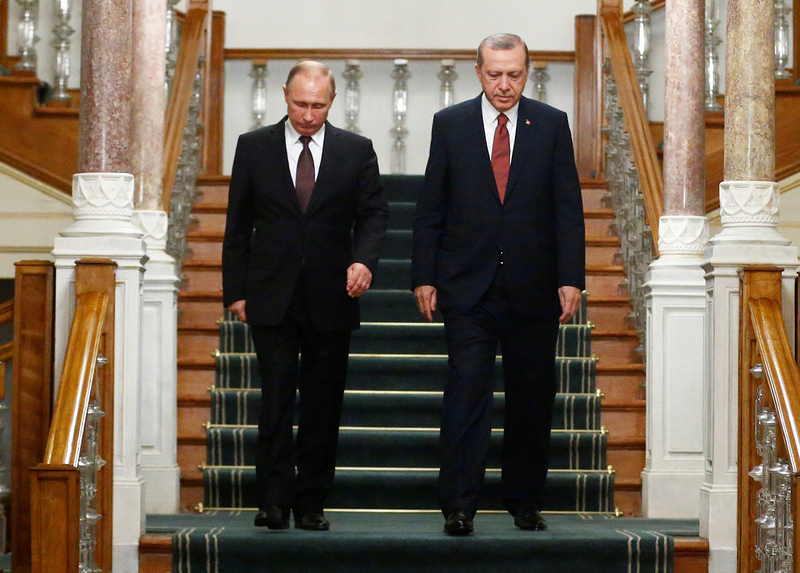 What will Putin and Erdogan discuss in Moscow? Russian and Turkish presidents Vladimir Putin and Tayyip Erdogan arrive for a news conference following their meeting in Istanbul, Oct. 10, 2016. Kremlin summit to focus on the possible removal of economic sanctions against Turkey, compromises on solving the Syrian issue and the purchase of S-400s. Turkish President Recep Tayyip Erdogan is due in Moscow March 9 for a two-day visit. He will meet his Russian counterpart Vladimir Putin and will participate in a session of the Council on High-Level Cooperation between Russia and Turkey. The agenda for Erdogan's visit promises to be very busy. The two sides will discuss issues relating to the complete restoration of relations after the November 2015 crisis, when Ankara shot down a Russian fighter that it claimed had violated Turkey's airspace. After the incident Russia imposed sanctions against a series of Turkish goods, introduced a visa regime for Turkish citizens and prohibited the sale of tours to Turkish resorts. However, despite the formal improvement of relations (an intergovernmental agreement on the construction of the Turkish Stream gas pipeline was signed, sanctions on agricultural products were canceled and the ban on the sale of Turkish tours was lifted), the visa regime for Turkish citizens is still in effect. Sanctions on a series of Turkish goods also remain in place. All these issues - amounting to a full restoration of relations - will be raised during Erdogan's visit. "Turkey wants Russia to cancel all the economic sanctions and the visa regime for Turkish citizens," says Kerim Has, an expert on Russia and Eurasia at USAK, an independent think tank based in Ankara. However he believes that this is unlikely. "Moscow is not interested in it. It is possible that sanctions on certain products or the visa regime will be lifted, but a full cancelation of the sanctions is unlikely." One of the main topics on the agenda is the regulation of the Syrian crisis, Erdogan's advisor Ilnur Çevik says, according to Russian press reports. Both Russia and Turkey are conducting military campaigns in Syria. Moreover, since January they have been carrying out joint operations against Islamic State militants, an organization that is banned in Russia. Having influence on the Syrian opposition, Turkey is a key participant in the Russian-launched process of peacefully regulating the Syrian crisis. "The number one subject will be Syria," Has notes. He says there are four main points on the Syrian agenda. "Future cooperation in Aleppo and in the neighboring regions; expansion of the composition of the participants (Qatar, Saudi Arabia and others) in the talks on the regulation process; deciding on options for Turkish and Russian cooperation on liberating Raqqa and Manbij once Ankara finishes its operation in Al-Bab; and Russia's position on the Kurdish units fighting in Syria." The issue of the transitional political process in Syria, will also be on the agenda, believes Anton Madrasov, a Russian expert on Syria at Moscow's Institute of Innovation Development. "The negotiation process requires concessions and compromise and it is important that Russia and Turkey discuss how they will influence Damascus and the opposition in order to find points of contact," says Madrasov. The leaders will also discuss a whole series of other questions. Turkish political analyst Salih Yilmaz from the Ankara Yildirim Beyazit University believes that the sides will touch upon important issues for Ankara such as the PKK and FETO's activity in Russia. FETO (the Parallel State Organization) is a movement founded by Fethullah Gülen and is considered a terrorist organization in Turkey (just like the PKK) and is accused of organizing the 2016 attempted coup d'état. Russia does not recognize FETO or PKK as terrorist organizations. "Turkey is very worried by the fact that there is a Kurdistan Workers' Party office in Moscow," says Yilmaz. On March 1, the Russian Federation Council ratified the Russian-Turkish agreement on mutual assistance concerning crimes and the extradition of criminals. Experts believe that this will give the Turkish government leverage to pursue individuals linked to FETO and the PKK on Russian territory. "This means that with our actions we confirm our intention to interact not only on the issue of terrorism but also on the issue of extraditing those who Russia and Turkey consider politically unreliable," says Yuri Mavashev, director of the political department at Moscow's Center for the Study of Modern Turkey. Yilmaz says that Erdogan's visit will also be used to raise Turkey's possible purchase of Russia's S-400 anti-aircraft missile systems. This question was already discussed in a broad manner last November. At the time Alexander Fomin, head of the Federal Service for Military-Technological Cooperation, said that the issue of S-400 supplies to Turkey would be one of the main subjects at the upcoming session of the intergovernmental committee and Turkish Defense Minister Fikri Işık confirmed that Ankara was holding talks with Moscow on the purchase of the S-400s. Although a session of the intergovernmental committee took place in early December 2016, no concrete decisions on the S-400s were made. "The talks on the purchase of the Russian S-400s are just a distraction," Mavashev believes. "We have heard such statements from the Turkish side on many occasions." He thinks that in the end Ankara will prefer to buy military technology from the U.S., while cooperation with Russia will be limited. Read more: Will 'friendly' fire deaths in Syria dampen Russian-Turkish relations?